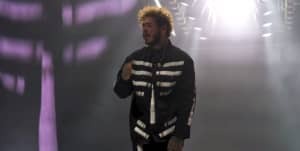 Post Malone has revealed the official video for his Number One single, "rockstar." The visual sees Post in full John Wick-mode, fighting off a host of adversaries with a samurai sword. It's directed by Emil Nava and ends with both Post and guest star 21 Savage drenched in blood. Hit play on the video above to check it out. Earlier this month Post Malone said in an interview that hip-hop is not the genre he turns to when he's looking to "think about life." 21 Savage, meanwhile, wrote an open letter asking "OG rappers" to stop disrespecting the younger generation of artists coming through and the music that they're making.